As soon as we had completed harvest on just one field of corn this fall, I knew our yields were going to be much better than I had ever expected. In June, we had leaves rolling up in some of our corn fields due to lack of moisture, but after that point everything from temperature to moisture was about perfect for raising corn. 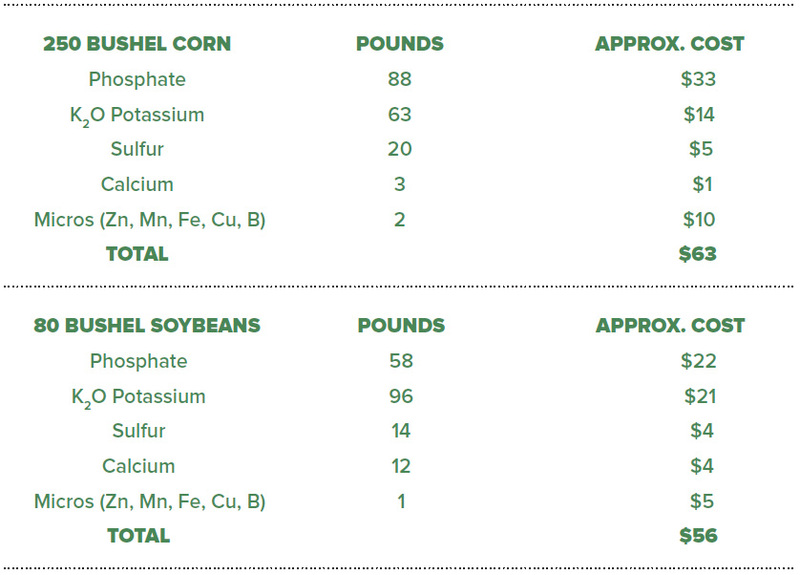 Our farm not only gave us record corn yields, but soybeans hit an all-time yield mark, too. Many farmers across the Midwest experienced the same thing we did, record yields. Unfortunately, high yields are accompanied by high costs including increased trucking, drying and wear and tear on augers and harvest equipment. One of the major things we’re talking to farmers about right now is replacing the nutrients they just removed with that record crop. Assuming the farmer leaves all the crop residue in the field and only removes the grain, here is what big yields can take out of a field. Please note that I’m not even including nitrogen that every farmer knows he needs. I’m just looking at all the other nutrients that are often neglected. As a farmer, you may not have whole fields averaging 250 on corn or 80 on soybeans, but in a year like this year you may have had many areas in fields at those yield levels. The important thing to remember here is if you don’t replace what you remove, you are mining the soil and going backward in terms of soil nutrient levels. `While I realize many non-farmers fear that farmers are over-applying fertilizer, as an agronomist I can tell you on average over the last 10 years all these big yields are creating the opposite effect. The average U.S. farmer is removing more fertilizer than he or she is applying. Every farmer was applauding the big yields this fall, but the challenge now is to build our soils back to pre-2016 levels and get ready for even higher yields in the future. Darren and Brian Hefty’s AgPhD programs help farmers take their operation from good to great by sharing information ranging from how to maximize your fertilizer program & tiling to stopping those yield-robbing insects and crop diseases and more. If you’d like to learn where you can watch or listen to Ag PhD, you can find the listings at agphd.com.